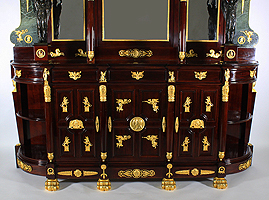 An Impressive Napoleon III Empire Revival Mahogany, Marble, Gilt-Bronze and Patinated-Bronze Mounted Credenza Buffet, After Pierre-Philippe Thomire (1751–1843). 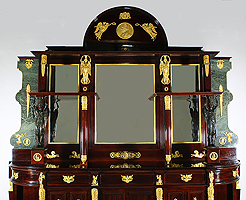 The large mahogany and green marble upper body with a domed top centered with a circular ormolu profile plaque of Napoleon signed L. Dergers, surmounted with a pair of allegorical gilt-bronze winged maidens holding crowning wreaths. 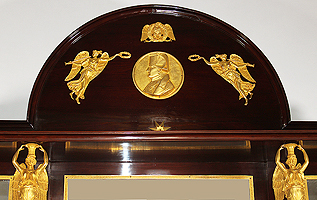 Below, an allegorical pair of gilt bronze winged maidens with their arms raised and flanked by a pair of Egyptian revival masks of females, all above a pair of patinated bronze winged maidens on mahogany stands mounted with Napoleonic plaques and flanked with a pair of gilt-bronze mounted circular torches. 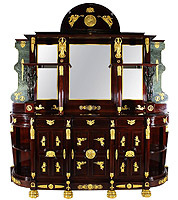 The green marble side panels surmounted with a Napoleonic crest with the letter "N" below an eagle, a burning flare torch and a winged crowning maiden next to a Napoleon profile plaque. The frieze centered with a gilt-bronze plaque of a maiden and flanked with two pairs of mythological hippocampus. 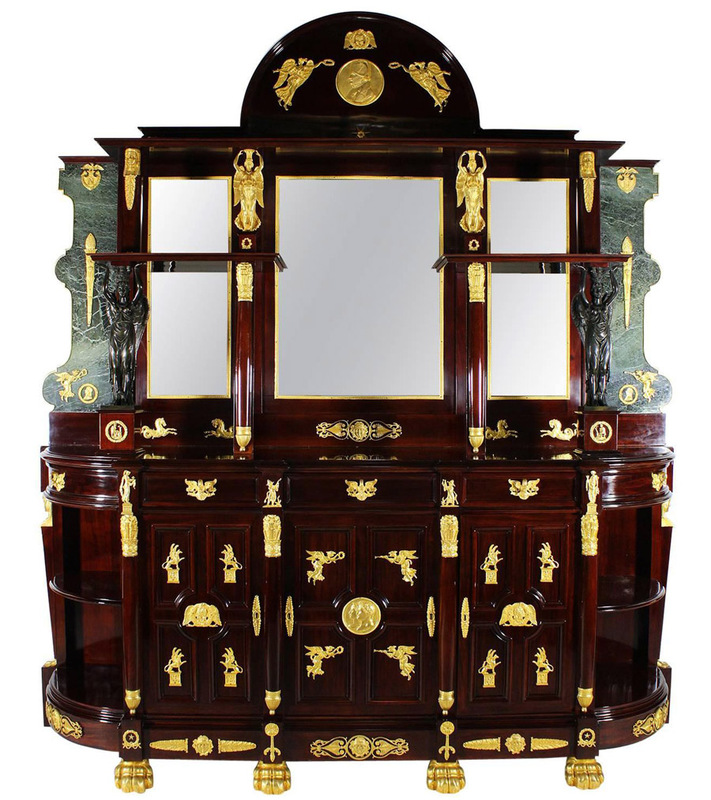 The lower cabinet with corner shelves and three front drawers with two corner drawers with swan ormolu handles above three doors surmounted with mythical birds, winged maidens, Napoleonic profiles, eagles, standing Chinoiserie and Roman figures. Circa: 1870. 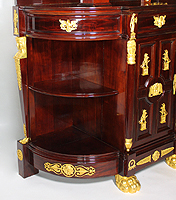 Please click here to view a matching pair of smaller server cabinets being offered separately.